Did you know that electric demand is just as important as the use and cost you are tracking in UtilityDirect? The consumption and cost is crucial to track as you need to know what you are spending and using, but it only tells half the story. Demand tells the other half. The electric demand that you use helps determine the rate that is paid for the electricity you actually use, or kWh. Here’s why. Let’s say you have two buildings, roughly the same size, that you are tracking the electricity for and are both using 10,000 kWh for a billing period of 30 days. Building A, on the left, and Building B, on the right. 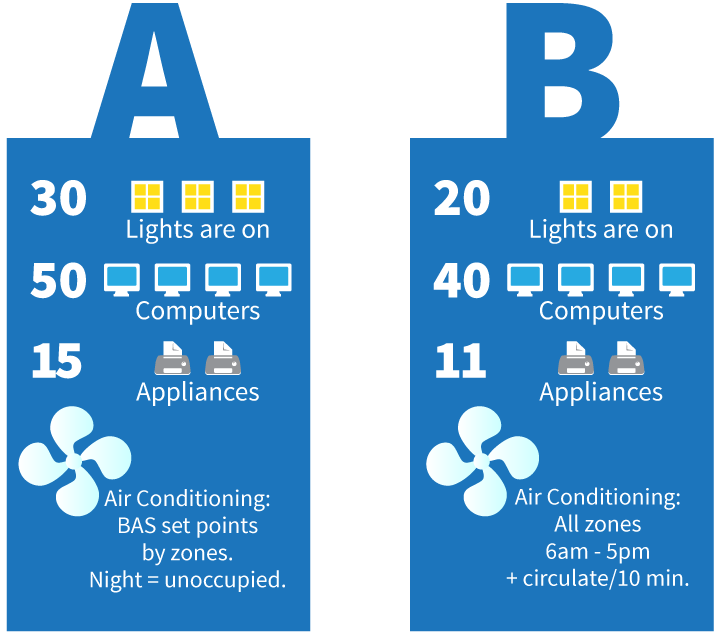 Why is Building B’s electric bill more expensive? The most likely reason is the demand. This is a very simple example, but you can see why Building B is costing more. The HVAC System is not running efficiently and is costly to operate because it is on more frequently throughout the day compared to Building A. A simple adjustment to the building automation system will help with the consumption and demand. It may take a little while, but savings can be realized. It can get more complicated than this, but if you track the demand and your electric bill seems out of whack, it would be simple to run a report to compare the demand in the current month to the same month in the previous year. If it is significantly higher, then it could be a red flag that something is wrong with the building. This is where you can work with the Facilities Department to identify what the issues are, rectify them, and see if it makes a difference. This is the Demand and is that amount of electricity demanded from the electric company and it helps set the rate. It is measured every 15 minutes by a meter. You can input this monthly in the “Billed Demand” column in UtilityDirect. This is the amount of electricity that was actually used and billed for and is measured every hour of the day by a meter. This can put in the “Use” column in UtilityDirect. Commercial customers are billed for hourly consumption patterns (kWh) and their peak demand (kW) for energy, while residential customers are only billed for consumption since homes generally have a small amount of demand overall. You will most likely not see Demand on your bill at home. What’s the difference between Registered Demand and Billed Demand? Should I put anything in the Registered Demand column? First, the simple answer. The Billed Demand is the demand that you see measured in kW on your electric bill. It may say Actual Demand or something similar. Now for the more complicated answer: More than likely, this does not appear on your bill. If it doesn’t, then you can leave that column blank in UtilityDirect. Think of Registered Demand as what the electric company calculates the demand “should” be for the building. However, the Billed Demand is the actual demand. 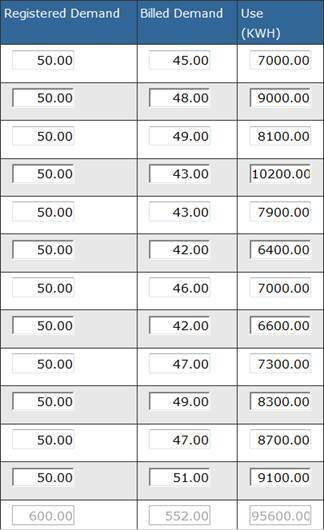 If you know both the Registered and the Billed Demand, then you can compare it side by side each month. More than likely, you will only see the Billed or Actual Demand on your bill. For more examples and a more detailed explanation, the following link will help demystify Demand and how it is calculated. As always, if you have any questions about demand or any other aspect of UtilityDirect, please feel free to contact the Client Service team here and we will be happy to help any way that we can.